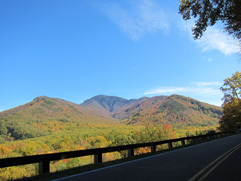 Some of the most photographed areas in Great Smoky Mountains National Park include Cades Cove, Little River Road, Balsam Mountain, Campbell Overlook, Roaring Fork Motor Nature Trail, Foothills Parkway, Little Greenbrier School, Clingmans Dome, Cataloochee Overlook, Parson Branch Road, and Morton Overlook. The overlook offers along this trailway offers views of the vast wilderness where some Cherokee Indians retreated to avoid removal on the tragic Trail of Tears. From the picnic area you can either turn around and return the way you came or continue down the one-way, gravel Balsam Mountain Road. Driving time to Cherokee is about one hour via the Balsam Mountain Road which is maintained in condition suitable for passenger cars. Travel along 11 miles of open-air valleys surrounded by majestic mountains flaunting their Fall colors. Throughout the Cove you will see historic buildings, including rustic log homes of original residents of the Cove, several churches, an old mill, molasses making equipment, and cemeteries. Directions: From Gatlinburg, TN turn right at Sugarlands Visitor Center and travel 13 miles to Townsend, TN. Continue approximately 5 miles into the Cove. Located in the Cataloochee Valley, this driving trail is surrounded by 6,000-foot peaks. It is one of the most photographed areas of Great Smoky Mountains National Park. Highlights of your drive will include elk viewing, historic buildings, and, of course, the majestic mountains adorned in their Fall colors of orange, gold, and red. Directions: From I-40, exit at North Carolina exit #20. After 0.2 mile, turn right and follow the signs 11 miles into Cataloochee Valley. To get there from Oconaluftee or Cherokee, take the Blue Ridge Parkway to Highway 19. Follow 19 (toward Asheville) through Maggie Valley. Turn left onto Highway 276 N. Just before the entrance ramp to I-40 (but past gas station), turn left and follow the signs 11 more miles to Cataloochee. 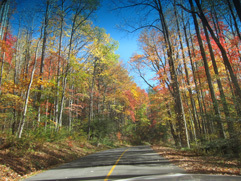 This drive is accessible from Newfound Gap Road (Hwy 441), 13 miles from Gatlinburg, TN or 20 miles from Cherokee, NC. The scenic mountain views are the most beautiful views in the Smoky Mountains. The Parkway skirts the park's northern side. This scenic drive stretches along 17 miles and travels along the backbone of Chilhowee Mountain between Chilhowee Lake and Townsend TN. You may view Great Smoky Mountains National Park and the beautiful valleys of the Tennessee River Valley bordered by the plateau of the Cumberland Mountains. Eighteen miles of a paved roadway offers a large variety of scenic views. 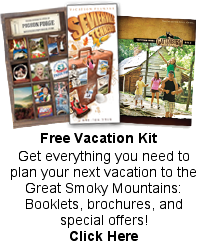 Mountain rivers flowing through forests, wildlife, waterfalls, and wildflowers adorn this area of the Smoky Mountains. The road travels from Sugarlands Visitor Center in Gatlinburg, TN to Townsend, TN. 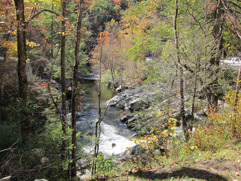 You may also venture through Elkmont, Metcalf Bottoms, and The Sinks. One of the most popular waterfalls on Little River Road is Meigs Falls. This 33 mile roadway stretches between Gatlinburg, TN and Cherokee, NC. You will find numerous pullovers where you will experience breathtaking mountain vistas and many oportunities for photography. There are several restroom areas, wayside exhibits, and the Rockefeller memorial. Rushing mountain streams, old-growth forest, well-preserved log cabins, grist mills, and other historic buildings can be seen along this driving trail. One of the log cabins is the Noah "Bud" Ogle Place which offers a self-guided walking tour of this authentic mountain farmstead and surrounding hardwood forest. You will also see a steamside tubmill and the Ogle's handcrafted wooden flume plumbing system. Just beyond the Rainbow Falls trailhead you have the option of taking the one-way Roaring Fork Motor Nature Trail. This narrow but paved road winds for six miles beside rich forests, waterfalls, and mountain streams. "Roaring Fork" is the name of the stream which the road roughly parallels. It is one of the larger and faster flowing mountain streams in the park. Following a heavy rainfall, you can see why it has this name. A waterfall called Place of a Thousand Drips is a wonderful place to stop along the trail. 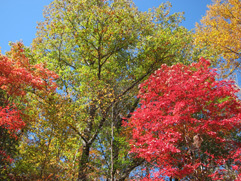 Roaring Fork Motor Nature Trail is accessible at traffic light #8 in Gatlinburg. Follow Historic Nature Trail to the Cherokee Orchard entrance to the national park.